Hanna graduated with a Doctorate of Physical Therapy from the University of Washington and has completed a post-doctorate fellowship in manual therapy through the Ola Grimsby Institute. Prior to pursuing physical therapy, she earned a BA in Psychology from the College of Idaho where she played lacrosse and basketball. 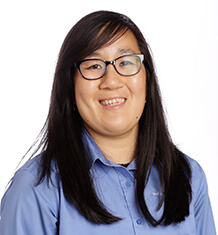 Following graduation from the College of Idaho, she completed a year of service through AmeriCorps VISTA and volunteered abroad at the Holt Ilsan Center for People with Disabilities in South Korea where she became committed to creating stronger communities through health, wellness and patient education. Hanna has recently achieved her Orthopedic Clinical Specialist (OCS) which is recognized as one of the highest standards of orthopedic care in the American Physical Therapy Association. She currently interested in improving efficiency when returning to activity and to sport (ultimate frisbee, lacrosse and jumping sports) after ACL reconstruction and shoulder repair surgeries. She thoroughly enjoys helping improve her patients return to activity through sport and functional motion analysis and off-season training programs for both youth and adult athletes. In her spare time, Hanna enjoys playing ultimate Frisbee, snowboarding, mountain biking, cross country skiing and enjoying a drink at a local coffee shop.